On training days, the access gate will be opened at approximately 8.00 am and will be locked at 8.30 am. Once the access gate is locked it will not be re-opened until all training groups have finished usually between 3 – 4 pm so attendees must be organised and prepared to stay all day. If you arrive late and the gate is locked, unfortunately there is no one available to let you in as the grounds are some distance from the gate. ALL dogs on the ground must be on lead at all times. They must have a current certificate of vaccination. ALL handlers must be current financial members of the TRDC. The cost for training days is $5 per dog, maximum 2 dogs per handler, no junior handlers [Cash only]. [If there are an excessive number of dogs at training days handlers MAY be restricted to one dog only as determined by Chief Instructor]. 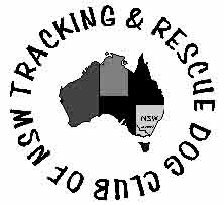 Tracking leads and harnesses are available for purchase on Training Days, please see Equipment Officer Helen Schaecken. There are NO toilets, water or convenient shade on the grounds, so it is necessary to bring lunch, snacks, drinks and water while a chair and some form of shade will make the day more comfortable. Each attendee will need to bring lots of used old socks, dark in colour and preferably wool or wool blend which seems to hold the scent better than nylon, and some old T shirts. Attendees also need to bring a “start” peg and lots of brightly coloured pegs for setting out tracks. Please collect your dog’s droppings. For the dog you need to bring water, lots of treats and a small sealable airtight container to put the treats in. Treats should be something the dog loves to eat and rarely gets - cabanossi, cooked chicken, grilled steak etc. The treat container is at the of the track so need to bring enough treats for several tracks . For a non food oriented dog need to bring a special toy or tuggie. PLEASE CLEAN UP AFTER YOUR DOGS AND TAKE ALL YOUR RUBBISH AND DOG BAGS HOME WITH YOU. Please click here for directions to the ground. The next general meeting will be the Annual General Meeting in October 2019.